We know we say this every year, but this year was truly our biggest yet! We doubled our readership, we did talks in several cities, we dove into B-movies, we tackled some immense and important features, and we launched a campaign to ensure the sustainability of the site. The site and our features got a lot of press this year, from The Washington Post and Creative Review to kotaku and io9. We even had a food columnist cook us an all-appetizer meal! Read on to learn about the site’s growth, current trends in title design, and what’s ahead. We told you we were growing! 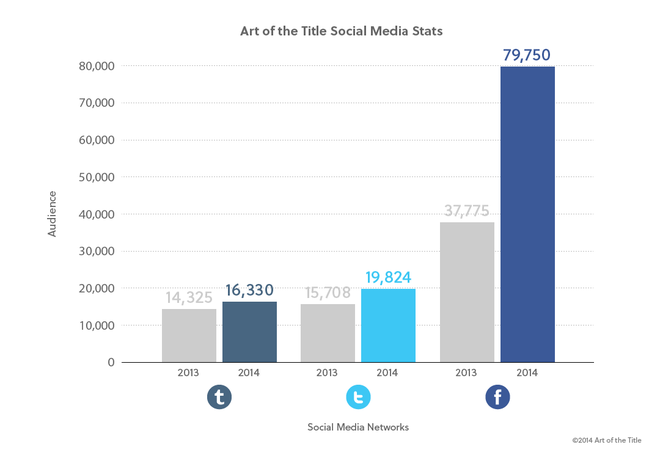 Facebook is a behemoth! We’re gonna need a bigger boat. This large increase in readers is one of the reasons we needed to launch a Patreon campaign. It’s a lot of work keeping up with all of you! 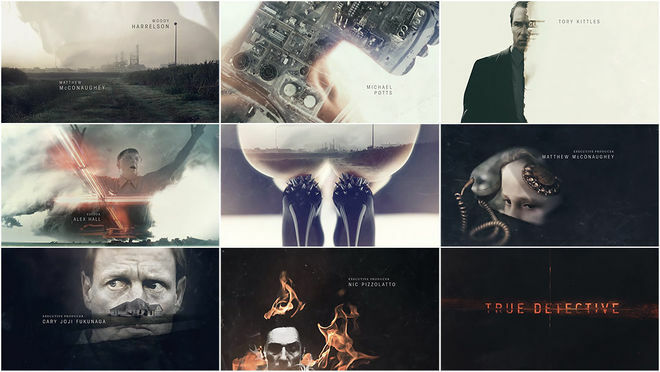 True Detective knocks it out of the park! The feature was shared, tweeted, and reblogged nearly 20,000 times. It’s also worth noting that half of our 10 most popular features were about television opening titles, highlighting the continued shift to a more cinematic TV experience. Cable networks and streaming services are now investing heavily in original content, and consequently the title sequence is enjoying a surge in popularity. Unsurprisingly, Se7en continues to be a favorite among fans. The grimey and foreboding title sequence that ignited a new wave of title design in the ’90s is still going strong. Winter is coming. 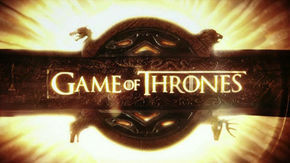 Our feature on Game of Thrones (originally published way back in May of 2011) also continues to be quite a popular article. Fans of the HBO fantasy series apparently just can’t get enough of Elastic’s fantastic work — and neither can we! And for the third year in a row, a video game title sequence is one of our top 10 most popular articles! Aside from Deus Ex: Human Revolution and The Last of Us, this year we also featured the title design of video games Alien: Isolation, Octodad: Dadliest Catch, and Device 6. Our personal favourite moments this year run the gamut from new content we published, to new relationships established, to funny bumps along the way. 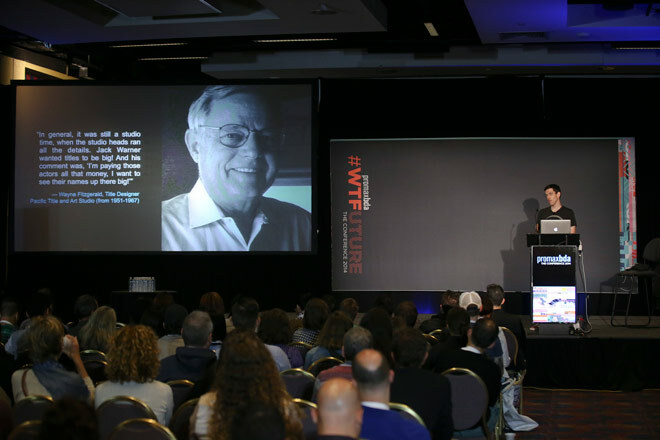 Will Perkins: A definite highlight was presenting at SXSW. In a field dominated by film and television title design, it was a thrill to put video game title sequence and title screen design in the spotlight. At the Vimeo Theater, Lola and I gave a talk before the Title Design Awards Finalists screening which included a brief history of title design in Hollywood, the emergence of video game title design, and the possibilities of the medium. The talk capped off with an interview and discussion with filmmaker and title designer Henry Hobson. Lola Landekic: Ooh yes, SXSW. What a great festival. For me, it was a joy putting together our article on MacGruber, which is probably the funniest and most swear-filled article we’ve ever published. A real collaborative effort on that one. Pepsuber is incredible and Jorma Taccone is one funny man. 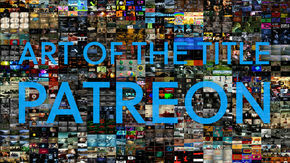 Ian Albinson: Launching our Patreon campaign was wonderful, as it brought recognition to something that many of our readers probably didn't realize – the fact that only three of us run Art of the Title and that we need the support of our readers to keep going! Lola: I loved our interview with legendary designer Wayne Fitzgerald about his gem of a title sequence for 1958’s Auntie Mame. There’s nothing so amazing as hearing about a creative process from the designer himself more than 55 years after the fact. And of course, the opportunity to make “title sequins” puns. Ian: Having visited Los Angeles-based studios in 2013, it was nice keeping it East Coast with a day at Imaginary Forces’ offices in NYC. It’s great seeing work in progress (which is often not possible due to NDAs), and this time we were able to get in on the ground floor with our article on Manhattan. Will: Participating in the Toronto International Film Festival’s Reel Comfort series, an outreach programme designed to provide a film-based creative outlet for hospital patients who have limited therapeutic and rehabilitative activities available to them. Ian: It was nice to be invited back to the PromaxBDA conference, and an exciting challenge to present “100 Years of Title Sequence Design” in a mere 40 minutes for the more than 500 people attending the talk in New York this year. Lola: Definitely diving into Madchester with the opening to 24 Hour Party People. Being able to interview Central Station Design, who are behind some of my personal favourite band artwork, and take an in-depth look at their process and history. Incredible stories. Will: Of course, then there was The Tale of the Mystery Title Designer. Tracking down title designers is always a challenge, particularly if the sequence in question is almost 25 years old. We spoke to more than a dozen people for our Halloween feature on the classic kids TV series Are You Afraid of the Dark? (including its creator and the music director) and not one of them could tell us who’d designed the show’s opening! It was only after publishing the feature that we finally found the mystery designer… Stay tuned for an update! A selection of press coverage and features we contributed to this year. 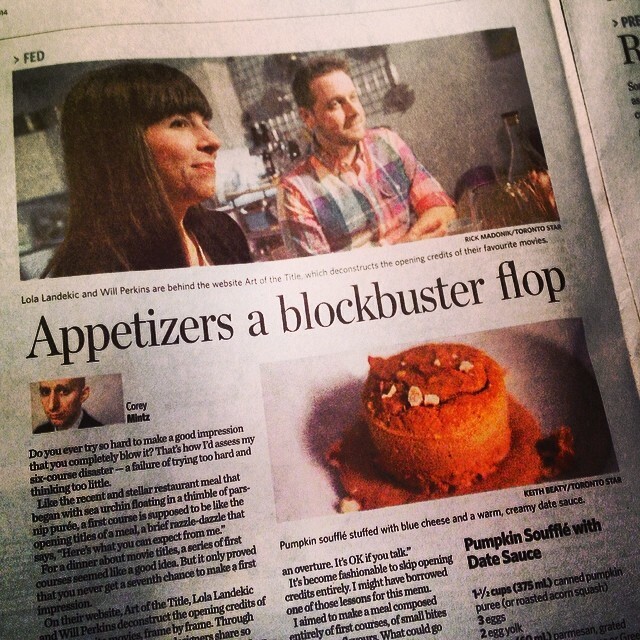 Lola and Will featured in The Toronto Star: A dinner party featuring only first courses, for guests who obsess over movie credits. io9: Okay, Why Wasn’t This Iron Man 3’s Credit Sequence? Functionality – We continued to update both front and backend features on the site, including adding the ability to search by director as well as by country. We sweetened the layout of the Designer and Studio pages to include all related articles in one easy to view layout, and also added Amazon links on all poster frames. And we also migrated to newer, speedier server hardware for that lickaty split response you all demand. As always, the backbone of our video content was provided by Vimeo's incredible Pro service, and they delivered our 1,618,040 video plays with aplomb. Sponsorship – The site had continued support from wonderful sponsors like Adobe Typekit and Maxon. They were joined later in the year by the New York Film Academy. Thank you for supporting our vision and helping the site to remain vibrant and healthy. We are actively seeking organizations and companies for article sponsorship in 2015, so get in touch to inquire about how to get involved as a sponsor today. Here’s a few things that we’ve got in the works for 2015. 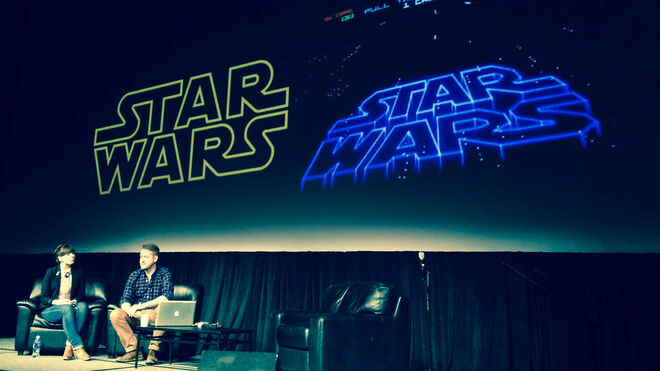 A return to SXSW in Austin, Texas to once again facilitate the annual Excellence in Title Design Awards. A couple of large and very exciting projects that we can’t reveal just yet!